The details: Get this box for only $1.98 today! (Regularly $2.85.) 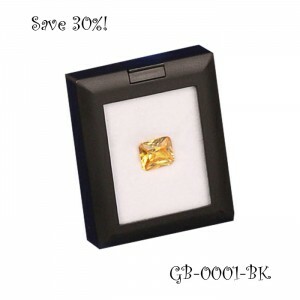 This great Glass-top gemstone box can be placed flat in your case or just fold out the easel and stand the box up for an eye-catching display! Box comes with two sided foam in black and white allowing you to select the optimal color for your gemstones. Measures 2 7/8′ x 2 1/4″ x 5/8″. Also fits into item 96-T1 for a complete display. Shop Glass-top Gem Box here!